What makes good functional clothing? The primary "function" is to wick moisture away from the body. So the skin stays dry, feels more comfortable and prevents getting cold. Just after a sweaty climb on a windy summit, men will appreciate the comfort of base layers and underwear. Nothing is more irritating than having to change wet clothes in a cold wind. How is functional underwear for men made? There are two main materials used in the production: Synthetic fibers and Merino wool. Base layers and underwear made of Merino wool is obtained from the fine wool of the sheep of the same name. But don't let it remind you of itchy or scratchy woolen jumpers. This material is naturally perfectly suited for functional underwear for men. 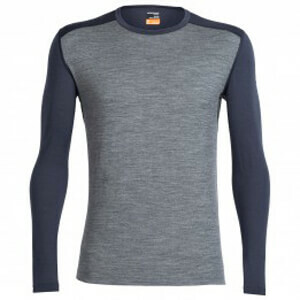 Merino wool does not scratch, has elastic properties and is naturally wicking. In addition, it is breathable and the fibers have an odorless property, allowing it to be worn over several days without unpleasant odors. And even a surprise rain shower isn't a problem. Because even when wet, the wool is still warm. The package is completed with natural UV protection and washing efficiency for the perfect base layers and underwear for men. Synthetic base layers and underwear for men imitates the natural properties of Merino wool. Wicking, breathability, comfort and UV protection properties are all there. Manufacturers try to combat the tiresome subject of odors in synthetic materials with antimicrobial properties and Polygiene treatment with silver ions. Underwear for men made of synthetic fibers has a faster drying time in exchange for poorer thermal properties when wet. Merino wool base layers and underwear for men are in the lead in this respect. Wool is a natural, renewable resource and biodegradable without waste. However, many manufacturers make synthetic fibers from recycled plastic, so they're also environmentally friendly. All these properties are of course the same for base layers and underwear for women and for all kinds of sports (e.g. for skiing) too.